BCECE (LE) Syllabus 2019: Bihar Combined Entrance Competitive Examination Board (BCECE) is going to conduct the BCECE (LE) entrance test for taking the admission in the 2nd year of Engineering. Candidates who are preparing for this have to know the BCECE (LE) Syllabus and BCECE (LE) Exam Pattern. Latest Update: Previous Year’s Paper Link Updated Check the links below. For that simplification, we provided here all the details regarding the Lateral Entry exam of the BCECE. Candidates can prefer this for their simplifications. BCECE conducts the various exams for the state level. For the candidates who are appearing for the BCECE (LE) for Engineering have to know the syllabus details. The syllabus will help the candidate to know the topics, Which will be covered in the exam so that candidate can do better preparation for that exam. For that purpose, we provided here the BCECE (LE) Syllabus for Engineering. BCECE(LE) Conducts the Para-Medical exam for those candidates who are interested in the medical field. So the candidates who are interested in the medical course and want to join at the state level can prepare for the Para-Medical exam. The detailed syllabus for the BCECE (LE) Para-Medical course is provided below. Candidate can prefer this for their preparation. BCECE (LE) also Conducts the Pharmacy exam for those candidates who are interested in the medical field. So the candidates who are interested in the medical course and want to join at the state level can prepare for the Pharmacy exam. The detailed syllabus for the BCECE (LE) Para-Medical course is provided below. Candidate can prefer this for their preparation. # All these syllabi also include Technical English subject in their Respective syllabus. For the detail of each and every topic candidates can prefer the Official Brochure. The previous year question paper helps the candidate to know the exam pattern and the type of questions come in the exam. By solving the previous year question paper candidates gets the accuracy and also they are able to manage the time. So by seeing that benefits, we provided here the BCECE (LE) Previous Question Papers. Bihar Combined Entrance Competitive Examinations Board released the exam pattern for all the candidates. 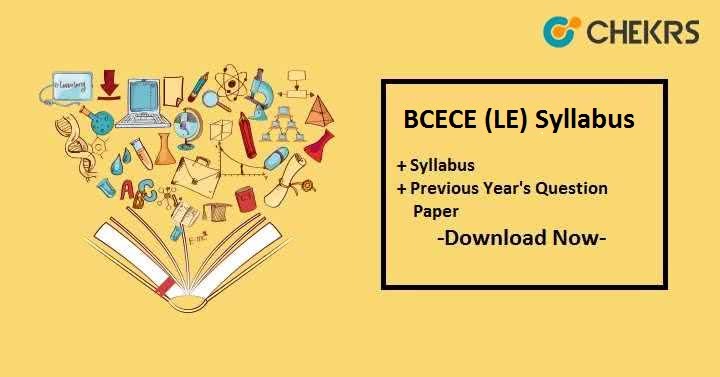 The Bihar BCECE (LE) Exam Pattern consists of the details regarding the mode of the exam, Type of the questions come in the exam, negative marking and the dividation of the question paper so for that we also provided here the BCECE(LE) Exam Pattern.